Chicken breasts can dry out easily, but poaching them in coconut milk keeps them velvety soft. 1 Open the coconut milk and scoop out 3 tbsp of the solid cream (if it’s mixed, then just take the milk); set aside in a small bowl. Pour the rest into a small saucepan and add the lime zest and chicken. Cover, bring to the boil and then simmer over a low heat for 10 minutes, until the chicken is cooked through. Set aside. 1 minute. Drain, rinse under cold water to cool and then halve lengthways and set aside. Whisk the lime juice, fish sauce and sugar into the reserved coconut cream until smooth; add 1 tbsp boiling water to bring it together, if needed. 3 Lift the chicken from the poaching liquid and slice (discard the liquid). 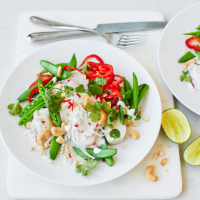 Arrange on plates with the pepper, sugar snaps, cashews, shallot, herbs and chilli. Pour over the dressing and serve. This recipe was first published in Wed Jun 08 10:24:10 BST 2016.